As a provider of custom screen printing and embroidery services, we create custom designed apparel you can’t find anywhere else for athletic teams, corporations, non-profit organizations, schools and community events. We realize there are many options when it comes to choosing a screen printer, but not all are equal. At Grasel Graphics, we pride ourselves on our customer service, graphic design and screen printing process. We streamline our entire process from customer order to finished product delivery. To you, our customers, that means we assist you every step of the way from ordering your apparel to creating your custom design. You’ll also be able to approve our artwork for your order before going to print. We have two automatic screen printing presses that allow us to efficiently print large client orders of 1,000 – 10,000+ shirts and jackets without compromising on design or quality. Once your order is in production, there is no need to worry. Our state-of-the-art equipment and talented employees do the rest; letting you walk away with your completed apparel that’s been screen printed to the highest quality. Our custom embroidery services are completed in-house on modern embroidery equipment. 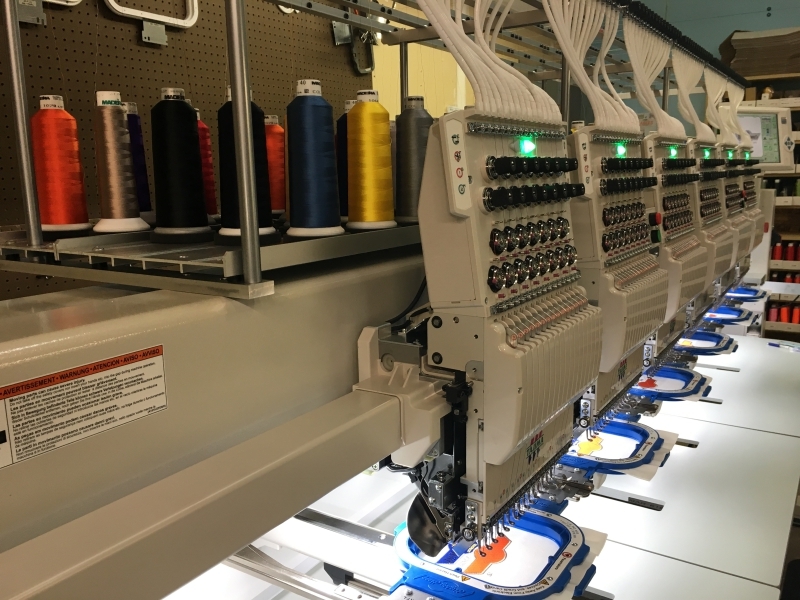 We use multiple embroidery stations which allow us to complete large apparel orders simultaneously. Our graphic design team can create a logo or design for your order to give your apparel a custom look found nowhere else. We couldn’t be happier with our creative graphic design team. Our artists have over 25 years combined graphic design experience. When it comes to screen printing shirts that everyone wants to own and wear, it boils down to the design. And a great design starts with a great artist. And we have two of the best. They are the creative backbone of our company. Not one of the designs we develop for our different clients are the same.